On June 1, the Laser Interferometry Gravitational-wave Observatory (LIGO) announced its third detection of gravitational waves. The new gravitational wave signal is similar to LIGO’s first two detections in that the signal came from a binary black hole merger. 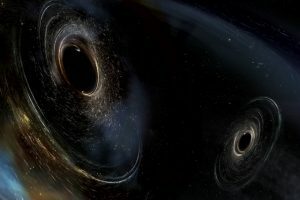 But researchers found something different this time: at least one of the black holes was spinning in the opposite direction of the way the black holes orbited each other. This “antialignment” could help scientists learn more about how black holes with different spins evolve into binary systems. Check out the discovery paper, as well as open access resources on LIGO and gravitational waves, an annotated collection of technical reports, peer-reviewed articles, conference papers, and theses, freely available in the DSpace@MIT repository, that describe work done at MIT, from the earliest gravitational wave science to post-detection research.